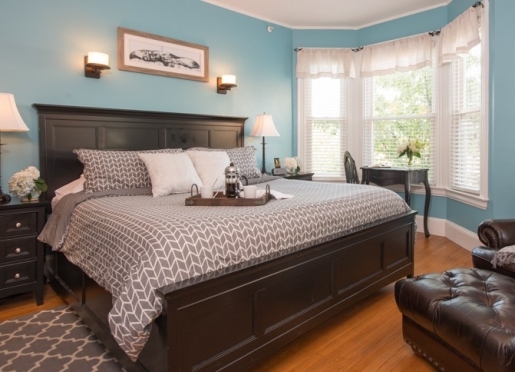 The Chadwick Bed and Breakfast rests in the historic district of Portland, Maine's west end near the old port harbor. 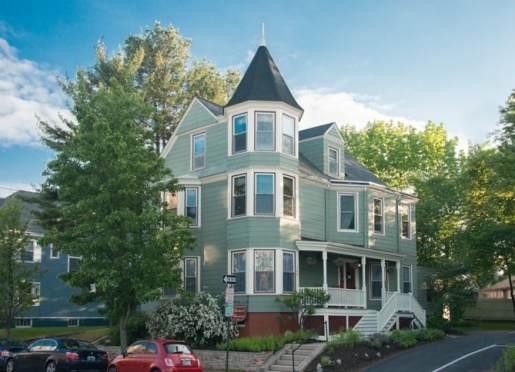 This Victorian home is ideally located within walking distance of the shops and restaurants of Old Port, only twenty minutes away, with its fun experiences such as the wine walks, food tours, cocktail tours, and brewery tours. The Portland Museum of Art and the many galleries and theaters in the exciting Arts District are also just a short ten-minute walk away from the Inn. The downtown area is full of world-class restaurants and has more eateries per capita than most cities in the United States. 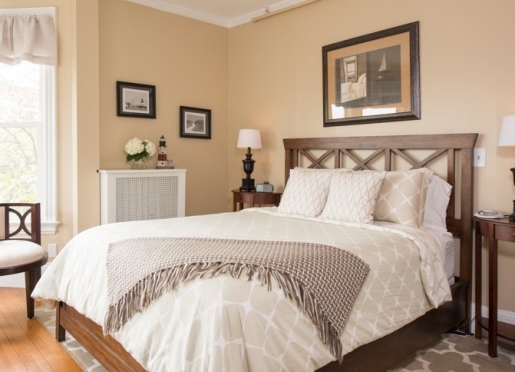 Your stay at The Chadwick Bed and Breakfast includes a gourmet breakfast, off-street parking, keyless front door entry, daily newspapers, DVD and book library, and concierge services. Each guestroom is equipped with a private bathroom, wireless Internet access, and a flat screen cable television with a DVD player. There is a mini-fridge stocked with complimentary beverages located in one of the common areas. Each morning begins with a gourmet breakfast. 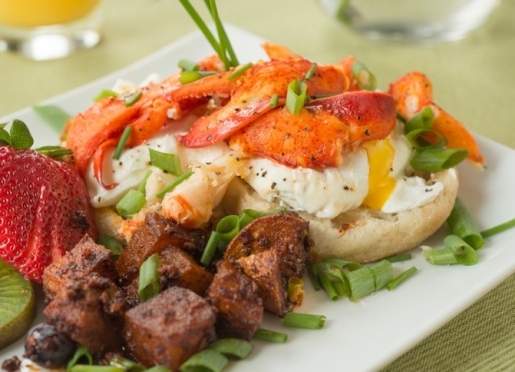 Some breakfast favorites include Garden Fresh Omelets with Paprika Potatoes, Housemade Granola, or our signature Maine Lobster Eggs Benedict with Lemon Scallion Hollandaise. The Chadwick is nestled in the leafy, quiet historic district in Portland's West End near the Old Port Harbor. Guests enjoy walking along the nearby Western Promenade that features some of the city's oldest Victorian-period homes. The views of Portland Harbor are also breathtaking. It is a short walk to the city's Arts District, home to numerous galleries, theaters, and the popular Portland Museum of Art. Also within walking distance is the city's lively Old Port, overflowing with fine shops and excellent restaurants. All rooms include new private bath with showers. Soft, luxurious terry robes are provided for those whose bathroom is located across the hall. 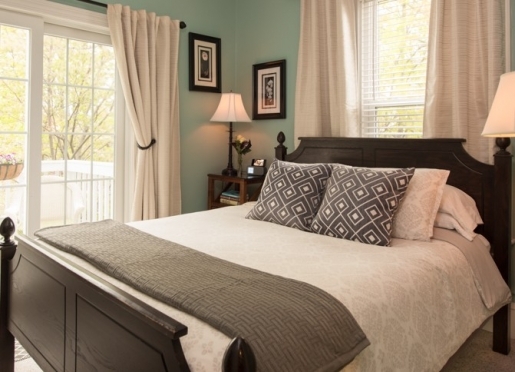 To ensure a good night's sleep, plush mattresses and pillows are dressed with the softest linens. Every room has a reading nook complete with a cozy chair and appropriate lighting. We include a full gourmet breakfast served each morning of your stay. Breakfast is always special at The Chadwick. Each day, we offer a two-course set menu. Start with our homemade granola, fresh mixed berries with mint syrup or a grapefruit brulee. Our signature entrees include Gosling Rum Croissant Bread Pudding, Lobster Eggs Benedict and Maine Blueberry Lemon Zest Pancakes. Please let us know of any dietary restrictions when you make your reservation. A bagged breakfast is also available for those guests needing to depart before 8:00 am. With so much to do right downtown, you’ll want to extend your stay! Whether you're looking to experience Portland via guided tour, peruse Downtown Portland's history, enjoy the beauty of our lighthouses, cheer on a sports team, or sample some of our local beer or mead, there are a wealth of activities to meet your expectations. If your reservation includes the first Friday of the month, don’t miss the First Friday Art Walk. Artists exhibit their work in backs of roving trucks, at street performances, in artist’s studios, and traditional galleries. This exciting monthly event offers you a diverse night of formal and spontaneous experiences. As an added bonus, every Friday night the Portland Museum of Art offers free admission after 5pm. Along with a thriving arts scene, Downtown Portland offers museums and galleries, each with their own impressive collections of artists, paintings, and other artistic works that would appeal to any art lover. Attend one of Portland's art galleries, or stroll down Congress Street for the First Friday Art Walk, for the latest pieces from local artists. For a compete list of galleries in Downtown Portland, visit the Portland Downtown District. Shopping and retail go hand in hand. Here you will find a list of local retailers of all types from fashion to food, arts and crafts, to sporting goods, furniture, collectibles, and so much more. There's a lot to shop for below! Find an even more comprehensive list on the Portland Downtown District website. Whether you're looking for dancing, theater, live music, or comedy, Portland allows you to experience a variety of live entertainment right downtown. Many of our guests want to continue their regular exercise routines while in town. We want to help you look and feel your best, so we’ve listed some local options for indoor exercise. Portland’s Peninsula is a great part of the city for walking. If you want to venture further than your feet or energy will take you, there are METRO Buses and reliable taxi services to keep in mind before renting a car. When guests ask whether or not they should rent a vehicle we really leave that decision to your own preference. For those who want to walk, from The Chadwick it is 10-15 minutes to The Arts District, 20-25 minutes to The Old Port, and 30-40 minutes to destinations on The East End. For driving directions to The Chadwick Bed & Breakfast or directions from the train station, airport, bus station, or harbor please click here. If you are considering purchasing real estate in or around Portland, many guests find that staying at The Chadwick gives them a glimpse into the lives of Portlanders and the beautiful, historic properties they own. 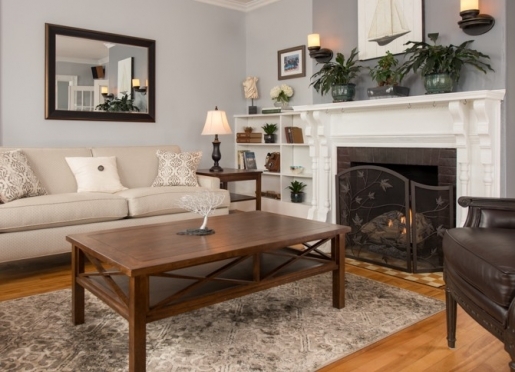 Our charming residential streets and convenient location make exploring the Portland real estate market simple and fun. We highly recommend contacting Eric Flynn, Designated Broker & Owner of eXp Realty. He will be happy to meet with you at the inn and give a tour of available properties in and around the city. Portland’s weather can be unpredictable. Typically Portland experiences temperate springs and sunny summers as well as crisp colorful falls and snowy white winters. If you are looking for one of the four seasons, Portland is the town to come too! A long-term weather forecast of Portland is likely to change so you may not find it as accurate as planning a few days in advance. We always suggest that you consult the weather forecast in Portland a day or two before you arrive. Sudden showers, higher than expected temperatures, as well as cool nights, have caught many Portlanders off-guard from time to time. Our advice is to pack a few layers (for any time of the year), comfortable shoes, and some rain cover (we provide umbrellas). For Portland weather throughout the year such as average temperatures and precipitation, visit The Weather Channel. Outside of the city, Maine offers great shopping and sightseeing in Freeport, Wiscasset, Rockland, Camden, Boothbay Harbor, and Bethel. Fishing, boating, camping, and hiking are a short drive away in the beautiful Lakes Region and the Western Foothills. Leaf-peeping in the autumn when the landscape is colored with the warm glow of red, orange, and yellow is always stunning for locals and visitors alike. Skiing, snowboarding, and snowmobiling are not too far from The Chadwick Bed & Breakfast in the winter months. All this, plus the White Mountains of New Hampshire and the historic city of Boston are a stones-throw away. With all that the region has to offer, you might ask to extend your reservation! 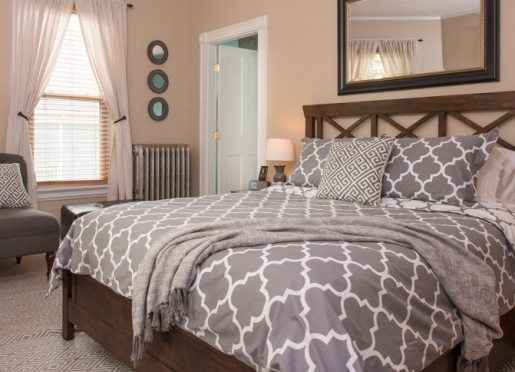 The Chadwick Bed & Breakfast is conveniently located in the Historic West End district of Portland, Maine. Travelers have close proximity to all modes of transportation including the Portland Jet Port (less than 3 miles away), train service by Amtrak Downeaster, and coach bus service via Concord Coach Lines or Greyhound. The islands of Casco Bay can be accessed via Casco Bay Ferry Lines. If you choose to drive, The Chadwick Bed & Breakfast is approximately 2 hours from Boston or Bangor, 4½ hours from Burlington, and 6 hours from New York City, Montreal, or Quebec City. Park in the driveway. Welcome to The Chadwick!